How bout we start it with the phrase "I think, therefore I am" ? The famous “Cogito ergo sum” or “I think, therefore I Am” is a statement used by Rene Descartes made by conscious awareness that has became an essential element throughout the shaping of the western history back in the late 18th century. It implies some sort of basis for the act of having the obsessive curiosity to equip one’s self of knowledge and the imergance of the idea to wanting things for one’s self at the same time, disregarding the old religious and monarchical systems. It was radically encouraging those who conduct his thoughts or imaginations in order to explore things and be able to believe in themself. This phenomenon marked the change from domestic industry to the rapid development of factory and manufacturing systems, which began in the textiles industry. This caused the employment of labours and the need to gain for more capitals. There was an absolute demand for better lifestyle, design and luxury, therefore designers took part in developing of mass production. The riches aim of becoming richer and the poor strive to adapt themselves in the so-called revolution. Indeed, from the urban thinkers of bourgeoisie or upper classes to the migrant workers from this era, it seemed to compose itself to have the inclination to pursue creativity, innovation and inspiration. This video depicted the rapid development of factory systems and the consequences of it that affects the lifestyle, which causes mass migration of villagers to town, seperation of classes, enhancement of machineries and trasportation systems, growth of trades and capitals, exploitation of labours, air pollution and the increasing of urban slums. 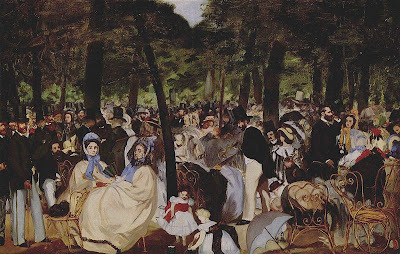 Here Manet has depicted the atmosphere imparts a sense of what the Tuileries gardens were like at the time; one may imagine the music and conversation, showing his friends, artists, authors, and musicians who take part, and he has included a self-portrait among the subjects. Included in the image are Manet himself, Charles Baudelaire, Theophile, Gautier, Henri Fatin Latour, Jacques Offenbach and Manet's brother Eugène. omg.helpful youtube!!! !deeper understanding and nice intro on manet!